Twelve family members of the men killed read emotional, at times angry and other times tearfully grieving, victim impact statements. Their sorrow filled the courtroom for nearly two hours. 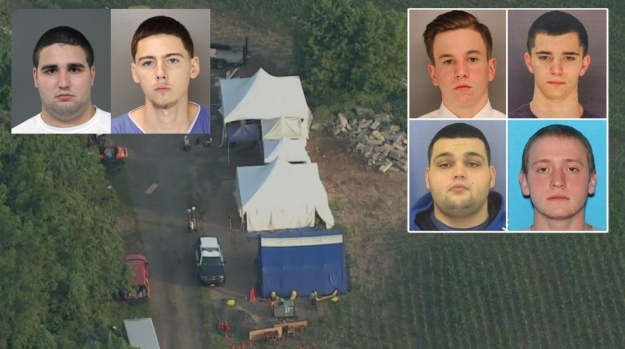 Cosmo DiNardo, the man responsible for killing four men and burying their bodies on his family's Bucks County farm last summer, pleaded guilty Wednesday morning. He now faces the possibility of spending the rest of his life in prison. Cosmo DiNardo received four consecutive life sentences Wednesday morning after pleading guilty to killing four young men and burying their bodies on his family's sprawling suburban Philadelphia farm. In an unexpected turn, DiNardo's cousin, Sean Kratz, rejected an offer to plead guilty to third-degree murder and related offenses Wednesday. Instead, the state will now pursue first-degree murder and the death penalty. Weintraub added that DiNardo could now testify against his cousin. The DA expects Kratz's trial to take place no earlier than next year. He spoke directly with Kratz in the moments before the young man officially rejected the offer in court, he said. Four civil cases against the cousins, Dinardo's parents and the family's holdings remain, attorney Tom Kline, who is representing the Finocchiaro, said. Twelve family members of the men killed -Dean Finocchiaro, Thomas Meo, Mark Sturgis and Jimi Taro Patrick - at times angry and other times tearfully grieving, read emotional victim impact statements before Judge Jeffrey Finley. Their sorrow filled the courtroom for nearly two hours. Before he was sentenced to life, DiNardo apologized to the families in a brief statement. “Your apology at least from my perspective comes across as false and insincere,” he said. He said he spent some time in the last week listening to DiNardo’s confession to law enforcement following the heinous slayings. “The tone of your voice stood out as having such a total and complete disregard to the value of human life,” Finley said. He added that if DiNardo were to ever be released from prison, Finley believes DiNardo would kill again. Police found the bodies of the missing men after a grueling, five-day search in July 2017. Three were lit on fire and placed in an oil tank converted into a pig roaster. One was buried in the ground. DiNardo, 21, had lured the men, ages 19 to 22, to his family's 90-acre farm under the guise of making marijuana deals. Each meeting turned into an ambush and then a bloodbath.